Visit the largest alien and ufo news website webelieveinaliens. Did Moses Talk to Aliens? Aliens have a strange history. Do you know aliens have been visiting our planet since the evolution times? It might seem like a bizarre idea to most of the people but it is true. Aliens possessed the futuristic technology since the Stone Age. They have been visiting our ancestors for many different reasons. Ancient aliens used to visit our planet to extract essential minerals and teach the laws of science and technology to human beings. We have been consistently fed with the idea that aliens plan to invade our planet and their intentions towards humans are vicious. The entire idea is false. Aliens have never harmed the mankind in any manner. We have been able to witness many UFO sightings but it has resulted in no harm to humans or earth. Aliens have friendly and supportive intentions towards the mankind. How do we know that aliens are friendly with the humans? We know it by studying the history of the mankind. Do you know that Moses was a friend with the aliens? Yes that’s right, Moses was either an alien agent or friend of aliens. One can find this shocking truth by deeply analyzing the Holy Bible. What is mentioned in The Holy Bible regarding Moses being an alien agent? There is no clear discussion which helps us gain the understanding that Moses was friends with aliens. All we need to do is to analyze the events when Moses had encounter with God. Do you know what happened on the Mount Sinai? Did Moses talk to God or aliens? Do we have conclusive evidence regarding what happened when Moses went up on the Mount Sinai? We have been able to understand the event by analyzing it in a completely unbiased and rational manner. Moses went up on the Mount Sinai to talk to the superior-power. Do you know that Moses talked to a burning bush on the Mount Sinai? Is it possible that a burning bush can talk? No, it is not possible. A spaceship might have landed on the Mount Sinai surrounded in the smoke of active volcano while the fire came out of the exhaust of the UFO. The aliens might have talked through a speaker while the fire and smoke covered the UFO. This seems more logical then the explanation present in the Holy Bible. Do you know that Moses went back to the Mount Sinai? On the second turn, he brought back The Ten Commandments. Why didn’t God give him The Ten Commandments on the first visit? 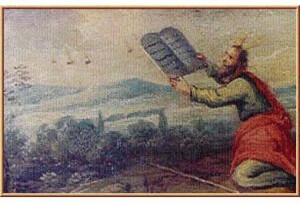 It seems like Moses lied to the people of Israel as he wrote The Ten Commandments himself or received them from aliens. Erich von Daniken presents his ancient astronaut theory by mentioning that Moses was indeed an alien agent who guided the mankind towards the path of betterment. One might not agree with the particular theory but there are plenty of evidences regarding the event when Moses talked to aliens on Mount Sinai.